Catherine L. Zhang '19 and Nicholas D. Boucher '19 preside over an Undergraduate Council Meeting. The Undergraduate Council debated the design and execution of a new UC initiative that gives pairs of student groups hundreds of dollars to throw social events—but does not include a way to verify how groups use that money—at its meeting Sunday. The grant, called the Matchmaker Collaboration Grant and established last December, randomly pairs two student organizations—selected by the UC treasurer from all organizations that apply via an online form—to host a social event. Selected duos receive $300 to throw one joint event. Currently, the grant is administered solely by Council treasurer Nadine M. Khoury ’20, as mandated in the original legislation. Multiple representatives at the meeting said they would like to establish a way to confirm grant recipients are not simply pocketing the UC’s money. The original legislation specified the UC would not ask for receipts from groups enrolled in the program, a stipulation that goes against the UC Finance Committee policy—applied to most other grants—that mandates grant beneficiaries submit receipts. Khoury said at the meeting that five sets of student groups have received funding from the grant so far this semester, meaning the UC has allotted $1,500 through the program in total. But according to Khoury, no grant recipients have thrown social events to date. “To my knowledge, none of them have happened,” Khoury said. UC Vice President Nicholas D. Boucher ’19 said after the meeting that the design and structure of the grant is meant to give groups more leeway in how they use Council money. “We wanted this grant to be there for students to be able to throw social events and buy whatever it is they would like for those social events,” Boucher said. 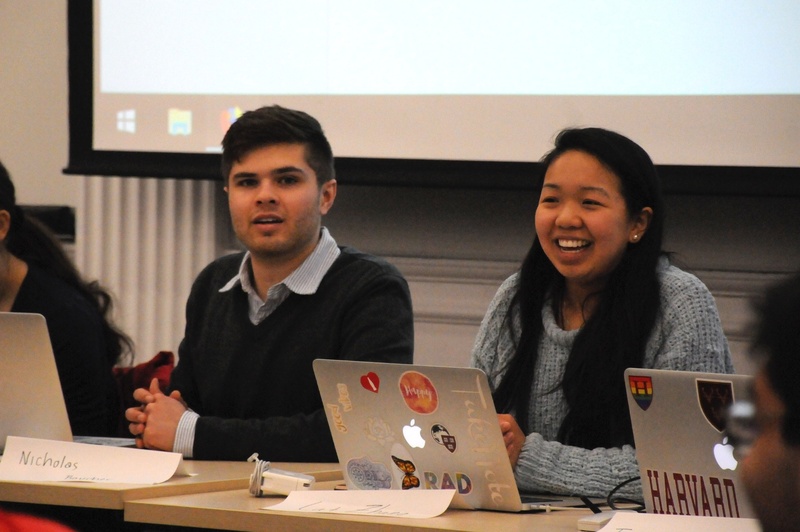 During last year’s UC presidential campaign, Boucher and Council president Catherine L. Zhang ’19 listed the establishment of the matchmaker grant as a key plank of their campaign platform. Boucher said in December, shortly after he was elected vice president, that he hoped the grant would help compensate for what he called a lack of social opportunities on campus. Boucher emphasized during Sunday’s meeting that, under the legislation establishing the matchmaker grant, the treasurer must follow up with student groups after the allocation of funding to ask whether the money was indeed used for a social event. Khoury said Sunday she plans to send out a survey to this semester’s recipients. Some Council members said they worry groups who fill out the survey may simply lie about how they used the money. Winthrop House Representative Evan M. Bonsall ’19 argued the structure of the grant leaves it ripe for abuse. Mather House Representative Eduardo A. Gonzalez ’18 said he favors more oversight of the initiative as a whole. A hacker purportedly ​attempted to access the Undergraduate Council's new software for processing funding applications this week. Srivastava, who served on the student advisory committee to the presidential search, declined to share the committee’s recommendations with the UC.